So, we went to Disney World. In February. I ended my then current job at the beginning of February, went to Disney, took some extra time off, and just before the month ended I started my new job. Honestly, it was such a fun and well needed trip for the two of us. I’ve never been, and wouldn’t settle to go with anyone but my mom for the first time, and she hasn’t been since she was 18 (that was only for a day!). For the yellow cake I used Smitten Kitchen’s recipe for the best birthday cake. I made 2 layers with a 9 in. pan and it overflowed. I was prepared for that possibly happening. Once the layers cooled I leveled them and the leftover cake was good to nibble on 🙂 For the fluffy white icing I made marshmallow icing. On top of the first layer of cake I had made a thick fudgy icing, made a graham cracker crumble (broken up pieces dribbled with melted butter and sugar, then put in the oven for about 10 minutes), and then I had put a layer of peanut butter icing over the graham cracker crumble. I improvised these icings since I only need such a small batch. I should have used more butter and cream for them because the cake separated a little at the middle with the graham crumble. So, you’d have a plate with a layer of yellow cake and fudge and graham cracker and then yellow cake covered in marshmallow icing with peanut butter and graham crumble. Too bad I forgot to take a picture! My cake was something else… ohmigosh, it was rich and took nearly 2 hours to eat a slice! 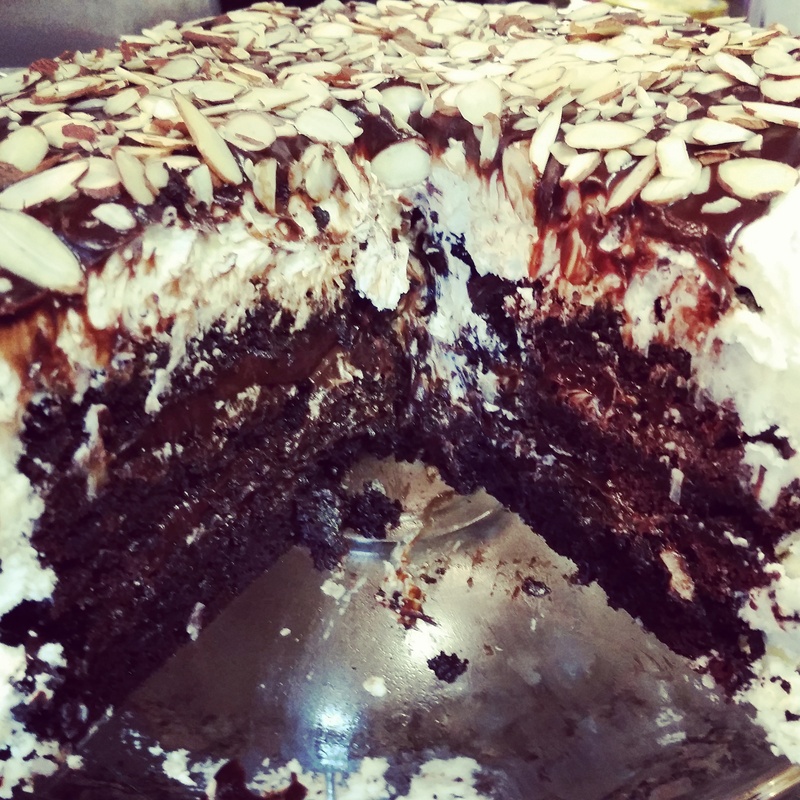 I said how about a chocolate cake with coconut icing? Being that my mom knew I’m a Smitten Kitchen fan, she made this recipe. The ganache was soooooooooooooooooooooooooo good. She used that between the layers and melted it over top the coconut icing. The icing recipe was for a bundt cake, but this layered cake was generously iced and still had some left over… I can’t imagine how much icing would have been on this bundt cake!! 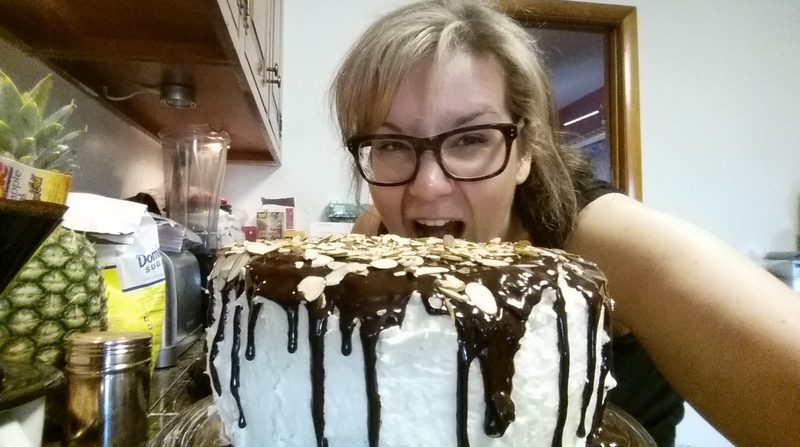 There was one issue that my mom ran into with the cake: again, 9 in. pans and the batter would rise and then fall. She’s not normally one for measuring, but she measured everything accurately. I didn’t find anything in the comments about this, so who knows what happened! Happy Birthday to the other April babies!! Birthday/Easter weekend was full-o-fun! Ryan Bingham, City Tap, walkin' around, Tara's outfit, matzo balls, family time, cake, circle time, serving Easter experiences with an amazing group of people, and... I think that's it? Oh, wait, Barrett got belly rubs too. I honestly couldn't put a number to how many times I've walked through the doors of Notre-Dame. How many times I went in there to sit in silence, to sit and pray, to just walk through and check out the art work again, and how many times I had the opportunity to introduce someone to a place I held so dear to my heart. I'd sit and eat lunch quickly while watching tourists push their way to Point Zéro before heading inside. On the most beautiful days, or even the most stressful days, I'd stop to get 2 scoops of Berthillon and watch the street performers or people watch. I remember having so many meals with this gorgeous cathedral as the backdrop. There were more than enough nights we missed the last métro, which lead us to getting the last pickings from a Lebanese food stand and watch the sun come up sitting along the Seine behind the cathedral. There was one extra special late night when we discovered a gate that wasn't locked, so we snuck in and had a very unofficial tour of the outside of the cathedral. It was that night I got to touch the outside of this magnificent structure that survived the Middle Ages, the French Revolution and WWII. I got to walk directly below the gargoyles and look up to see their toes curled underneath them. Knowing all that history and having the privilege to touch something that survived all was thrilling. My heart is heavy, but I'm so thankful to have these memories.